The irony. Mishpacha magazine is using this image to illustrate how extreme Lev Tahor is. This is how a woman has to look like to be allowed in Lev Tahor's village. 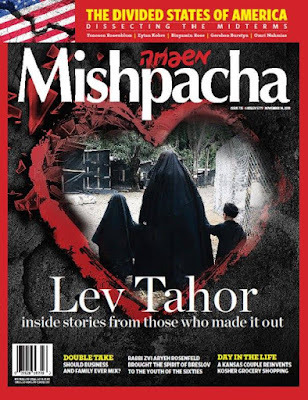 But this is also how a woman has to look like to be allowed onto Mishpacha's cover! However, let's be grateful for baby steps. In a 2015 Mishpacha article about burqas, they did not show any pictures of these women, instead showing numerous pictures of a doll draped in a burqa! So, let's be grateful for baby steps. Yeshivish society has progressed from giving the impression that women cannot be seen under any circumstances, to giving the impression that they can only be seen if they are wearing burqas. Progress you can't deny! I am not in the Yeshivish world, I do not subscribe to their positions of not showing women in magazines, but at the same time, I am not really offended by it. I think a legitimate halachic argument can be made for that approach, and I don't think that it should be called "progress" to move from one legitimate approach to another. The halachic argument that I speak of is the prohibition for men to look at women in a way that gives them pleasure. The Shulchan Aruch famously rules that it is even prohibited to look at the pinky of a woman if that sight gives him pleasure. Now, I think it's clear that this prohibiton is on the man. It's his job to make sure that he controls his behavior and thoughts. It's not the job of a woman to stop all public activity because someone might look at her inappropriately. However, I can hear the argument, that a picture of a woman (or a man, or anything really) serves the sole (or at least primary) purpose of being looked at. Now when a widely circulated publication has pictures of women that are meant to be looked at, it is likely that some of the readership will come to look at the pictures inappropriately. I mean, it's not even about controlling oneself... sometimes it's just a natural reaction to an image. So, now at the end of the day, pros and cons need to be weighed. Pictures of women in a widely circulated magazine will almost certainly lead someone to the prohibition as coded in the Shulchan Aruch. It may very well be a problem of lifnei iveir. On the other hand, in some communities (not all) many people (especially women) will take offense to such a policy... and offending others is almost certainly a halachic problem as well. There may be other considerations as well, like what does it do to the communal self esteem for women and young girls when only pictures of the opposite gender are publicized in their beloved publications and periodicals. I don't mean to take a side, but only to play Devil's advocate. I think both sides have legitimate halachic, psychological, and social arguments. The different approach may be a result of prioritizing these values differently or even just the makeup of their society (for example, women of different societies may react differently in terms of being offended to this policy). So, to say one practice is more "progressed" than the other side is not something I agree with. Shivim panim laTorah. Nice analysis, but it is based on the erroneous assumption that someone or some committee is carefully analyzing the halacha in the context of modern society and consequences. That's not how they make the sausages. You are entirely incorrect, and both sides are not valid. The requirement for tznius is just to be dressed in a tznius fashion. Once a person is dressed in a tznius fashion, there is absolutely zero problem at all halachically in having a picture of said tznius person in a magazine. The idea that a picture of a properly tznius dressed person in a magazine could give rise to lifnei iver is laughably ridiculous and with no halachic foundation at all. Isaac- if you look in the Shulchan Aruch, that's not necessarily true... at least from a shmiras einayim perspective. It's clear that there are parts of the body that is objectively prohibited for a man to look at, and those are the areas that need to be covered. But the Shulchan Aruch adds that even other parts of the body, whether it's the face or even the pinky, is prohibited to look at by a man if it gives him pleasure. Meaning, just because there is no requirement to cover it up, doesn't mean that it's permitted to look at. Now in general, all that means is that each man needs to know himself. If he is attracted to say, a pinky, then it's his responsibility not to look at it... it's not the responsibility of the woman to cover up. However, I can hear the argument, then when a magazine is widely circulated with pictures that are meant to be looked it, with pictures of women who are dressed appropriately... there may still be men, and maybe even a significant amount of men, who will enjoy the pictures that are shown, and can't really avoid it if they want to enjoy the magazine. Like I said, I don't believe there is a halachic problem with it, but I don't think the people who think there is a halachic problem are so far off. The more widely circulated a magazine is, the more likely it will be that some of their readership will get inappropriate amount of enjoyment from even an appropriate picture. That remains a ridiculous reason to erase women from magazines. You don't run things exclusively for the 0.5% of bizarre deviants to the detriment of everyone else. Especially when you consider the negative effects of the disappearance of women from all aspects of life, pictures, the ability to give a speech or lecture, awards, etc. It's extremely disempowering and removes proper role models for girls. When the invitation arrives honoring Mr. and Mrs. Stein for their work but only shows a picture of Mr. Stein, that is a terrible message. I think Yitz is mostly right. However I don't think it's the prohibition of lifnei eveir as that is debatable if it applies. I think its the culture. There were magazines int the past that had woman in it. This led to advertisements that were inappropriate for many of the people in the community esp. chassidim. Magazines will want to appear to the largest audience possible. With a blanket ban of now women in the magazines you appeal to the widest audiences. 50 years ago Yiddishe licht published a picture featuring the Satmar rebezin together with Tshubiner rebezin, without any sheelah, hachshir dore? This is really a ridiculous post. "in a society in which it is forbidden to show pictures of women, it is hardly surprising that women start to wear burqas." Is there any evidence of burqa-wearing women that come from the 'yeshivish" community? Did any of these families attend Ponvozeh? Brisk? The burqa-wearers has as much to do with the yeshiva community as it has to do with the DL community. That is to say, absolutely nothing. If you want to convince people of the merit of your argument, I would suggest some intellectual honesty. But it's your blog- so feel free to defame away if that's your preference. Well would it be that surprising if we say wives of Ponovezh and Brisk may start wearing burqas, if not burqas, then keeping a very strict, fanatical, extreme types of clothing?? The logic that associates burqa women with the rightmost (Chareidi or "Yeshivish") fringe of Orthodox Jewish society is unassailable. Just as the more left-leaning (i.e., "Modern") side of the Orthodox spectrum is often criticized for its too-progressive stance on women's issues, so too it is the decidedly regressive stance of the Orthodox far right that enables lunacy like this. Disturbingly, with different groups/sects of Jews trying to "out-frum" each other in their adherence to the latest fad chumrah, it seems to be only a few short steps from "bulletproof stockings" to these full-body stockings. If you can point to a single burqa family that was raised and educated in the yeshivish community I could take this argument seriously. But you can't. Because they don't exist. Milton, when one has an agenda and an injured ego, ridiculous posts result. As many keep saying, its a shame. I guess zoo stuff just doesn't draw the crowds.....and doesn't assuage the ego. "Ya think," what's your agenda in writing your comment? Yes, it would surprise me. Because I actually know people who attended Ponvezh and Brisk and none of them wear burqas. Yes, none of them. I also lived in the same neighborhood as some of the burqa-wearers so I have a good idea where they come from. It's not the yeshiva world. You assert, "If you can point to a single burqa family that was raised and educated in the yeshivish community I could take this argument seriously. But you can't. Because they don't exist." Not that it particularly matters to the credibility of my argument, but how do you know this? a) I've been asking this question for years from those making similar arguments and no one has ever responded with a name and b) more importantly, I spent years living in the heart of meah shearim among many burka-wearers. While I never spoke to any of the women I did speak with the men and know some of their "rabbis." I know where they come from and they are as much yeshivish as they are mizrachi. Just curious, you (and RDNS) are making an assertion. The burden is hence upon you to prove it, not upon someone else to disprove it. As someone with much close family in both Lakewood and Bnei Brak, whose sons learned in BMG and Ponivitch (and I myself spent a few years in Kol Torah), I agree fully with Milton. Burqua wearers are largely from the ranks of Ballei Teshuvah, and not from yeshivah families. R' Slifkin does your museum not do the same thing? "Why don't we say anything about evolution or prehistoric animal life? In part, it's because that's simply not part of our museum's mission; our museum is about the animal world of Biblical Israel. But another reason is that it would severely damage our educational mission. We want to teach as much as possible about the natural world to as many people as possible. And Israel is home to an extraordinarily diverse range of people, not to mention the tourists that visit. There are Jews and Christians and Moslems and Hindus and people who are not attached to any faith. All of them visit our museum. And within the Jewish people, there are secular Jews, modern Orthodox Jews (who generally accept modern science), and ultra-Orthodox Jews. The latter group itself in turn contains many diverse communities - Lithuanians, Chabad, Gerrer, Belz, and so on. Many of them are completely insulated from the outside world. They've never watched television. They've never even been to visit the zoo, because the zoo is open on Shabbat. They're certainly not going to visit a museum that has exhibits about evolution. Does it make sense not to create institutions that these communities will ever visit, and to continue to deprive them of knowledge about the natural world? Or does it make sense to have a variety of institutions available for the general public - some that teach the full range of modern scientific knowledge, and others with a mission that is more limited, but which will reach all communities?" Wouldn't the same argument apply to Mishpacha? Do you mean that I am correct in pointing out that, Mishpacha is doing the same thing you do. Just as you avoid displaying anything that some may find objectionable since "it would severely damage our educational mission"
And if by the absence of anything linked to "evolution or prehistoric animal life" in your museum, a visitor would assume he knew your position on evolution, and make other assumptions based on that about you, they would would be utterly wrong. May it be the same case that judging a magazine by its cover might be wrong? He’s agreeing with you. But there is a big difference. The dinosaurs are not disrespected by being left out. I am not sure what you mean, the issue R' Slifkin has with Mishpacha is not one that they disrespect women. I agree. Baalei teshuvah carry things to ridiculous extremes because they have no grounding. Lev Tahor was founded by a baal teshuva and most or all of its adherents are bts. Rav Berland and his followers ditto. Chareidi women refuse to relinquish their wigs despite opposition from Rav Elyashiv and other major figures. Dozens of anti-wig brochures have made little impact. Brochures urging women to wear ankle length dresses are also totally ignored. I don't know what sewer you live in where it's acceptable to make sweeping general statements like "baalei teshuvah have no grounding." You may find that BTs feel that they are not grounded because of the attitudes of vile bigots like you. It does not behoove you to call women "babes", even in a facetious way. It is a demeaning and, if I may, not-tznius, term. How do you know those are actual woman wearing those burqas? Chalila!! To add a little to devil's advocate I once did an analysis on this and this is what I could come up with.